The first installment of a trilogy by author Veronica Roth, Divergent is set within a dystopian version of Chicago. The nationwide film adaptation release was Friday, March 21 and we couldn’t wait to celebrate. 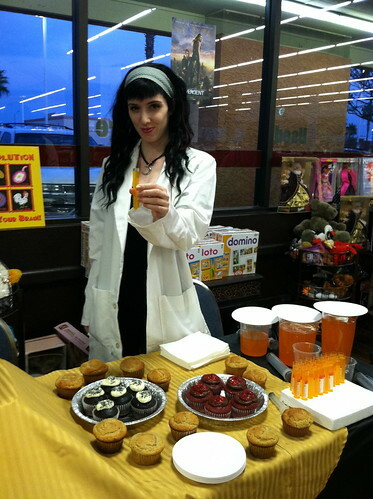 Bookmans Mesa invited fans to spend an evening getting to know one another and choosing their faction. We set up activities based on the factions described in the book. Abengation collected non-perishable food items for the United Food Bank while Bookmans Mesa matched dollar for dollar each monetary donation and collected $50.00 total. 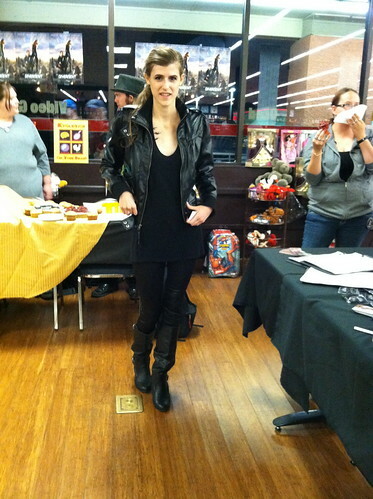 Shesten from I Heart Monster joined Erudite and hosted a knowledge based trivia contest. Imagine our surprise when Tris answered all the questions correctly and scored a Bookmans swag bag that included tickets to see the film at Harkins Cine Capri on Thursday. Attendees answered truthfully when asked questions by the Candor and received posters from the upcoming film. Amity tote bags, Dauntless tattoos, Aptitude Tests, Choosing Day and more free promotional movie merchandise were a big hit. We look forward to the book to film adaption The Fault In Our Stars, and are working on another event for you. Keep checking our events calendar and follow @bookmansmesa on Twitter for up-to-date information. If you’re 17+ and a fan of teen fiction, join us at our monthly book club, Young at Heart.